Defense attorney Richard J. Fuschino Jr., left, and his client David 'DJ' Creato appear in court for the beginning of Creato's murder trial on Thursday, April 20, 2017. He is charged with killing his three-year-old son, Brendan. 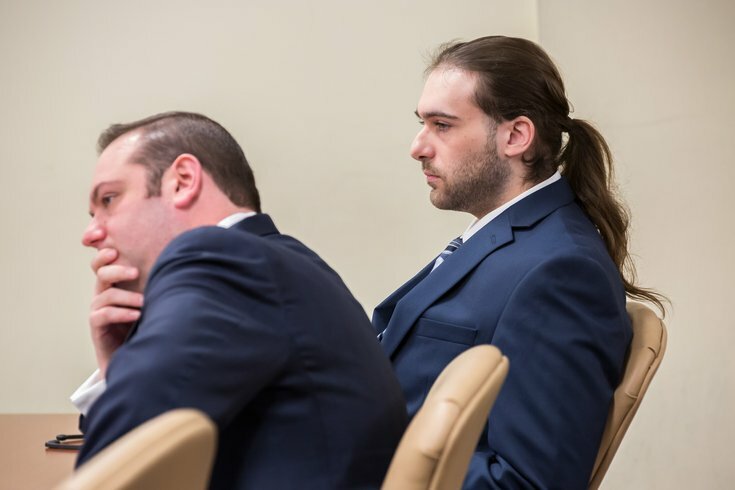 About 2,500 text messages exchanged between David "DJ Creato" and his then 17-year-old girlfriend will be presented at his murder trial, which opened Thursday in Camden with opening arguments. Creato faces charges that he killed his three-year-old son, Brendan, who was found dead on October 13, 2015, a little more than a half a mile from the apartment he shared with his father. Prosecutors say Creato, who was 21 at the time of the toddler's death, was motivated to maintain a relationship with Julia "Julie" Stensky. Assistant Camden County County Prosecutor Christine Shah, who is presenting the case against Creato, described Stensky as "difficult." She said the couple were fighting about Brendan in the week leading up to the boy's death and had exchanged 600 texts on October 6, a week before the boy's body was found. In one message Stensky wrote, "I want you to not have a kid in your life," Shah told a jury of 14 – 11 women and three men. Shah also emphasized the distance between the apartment and the "shallow creek" where the child was discovered a few hours after Creato called police to report his son missing. In doing so, she repeatedly mentioned the boy was afraid of the dark. 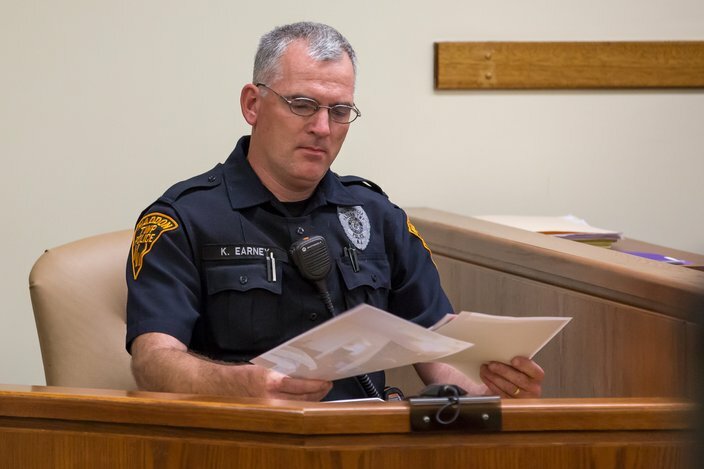 Haddon Township police Officer Kirk Earney took the stand as a witness in the murder trial of David 'DJ' Creato, on Thursday, April 20, 2017. Earney was the first officer to arrive at Creato's apartment on October 13, 2015, after he called the police to report that his son Brendan was missing. Shah also mentioned that the boy's socks were clean when he was found in the stream and that his slippers had been left in the apartment. One of those slippers was used to turn the police dog onto Brendan's scent, she added. Shah described the cause of death as some form of homicidal deprivation of oxygen. And while no one specific cause was ever pinpointed despite three autopsies, she said it was "so obvious" that the death was a homicide. She said investigators looked at several different scenarios on how the boy might have arrived in the park with clean socks, and said it was just impossible. The location where the body was found was a favorite spot of DJ Creato's, she told the jury. Defense lawyer Richard J. Fuschino Jr. began by telling the jury, "I represent an innocent man." He then asked his client to stand and face the jury. 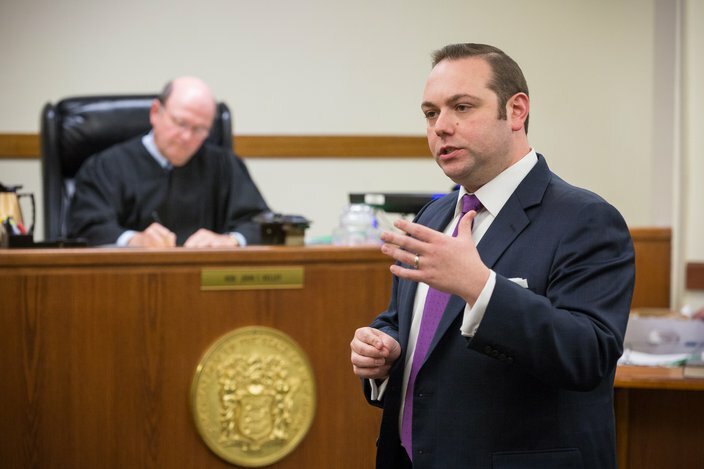 Defense attorney Richard J. Fuschino Jr. of Philadelphia speaks to the jury during the opening of the murder trial of David 'DJ' Creato on Thursday, April 20, 2017, at Camden Superior Court. Fuschino said while evidence will be presented by Shah, it "will not be proof enough." The lawyer said authorities "constructed this investigation" to show the father was their first suspect, the last person with custody of the child. He pointed out that no DNA evidence was found on cigarette butts found near the body, and certainly not his client's DNA. 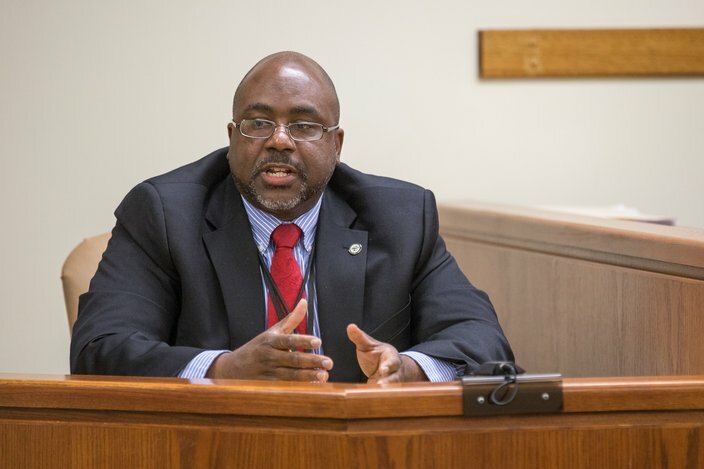 Camden County Prosecutor's Office Detective Lance Saunders testifies from the witness stand on Thursday, April 20, 2017, at Camden Superior Court, during the trial of David 'DJ' Creato, who is charged with killing his three-year-old son. Fuschino said the smokes were so fresh that ash was still intact, suggesting that some unknown person had been at the site. He also said tracking data on his Creato's cellphone shows the mobile device was not taken to the area where the boy was found. And despite the pressure and fighting provoked by Stensky not once did DJ Creato tell her – or anyone else – that he was there, Fuschino noted. "The is no evidence of anything showing he was there," said Fuschino, who asked the jury to find his client not guilty. Opening witnesses will follow, telling the jury about the call that Brendan was missing.